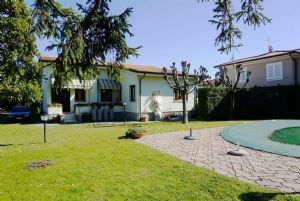 Charming villa Cleopatra located in Forte dei Marmi (320m.q.) with a garden all around the estate. In front of the white patio there is a swimming pool fenced in. 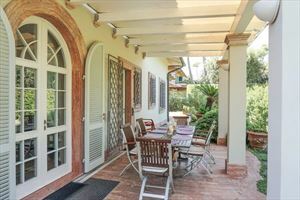 It is totaly involved in a peaceful and relaxing atmosphere and in the same time near the beach(only 700 mts,farway). on the low ground there are: large terrace as eating external room (with sofa ,dinner table,etc) entrance with saloon, dining room, laudry and 1 bathroom. On the first floor it is developped the sleeping area with 1 master bedrooms (plus 1 single bed and own bathroom), 2 double rooms, 1single room, with bathrooms. The estate has got all kinds of services and it has own private car and bike parking. On the villa is installed air conditioning system (ground and first floors), satellite TV, Internet Wi-Fi, allarm system, automatic gates. Also presents a covered parking place. There is also a mini-apartment for housemaid with an indipendent entrance, living room, kitchen and one double bedroom, one bathroom.